An awesome tool for aspiring cricketers. 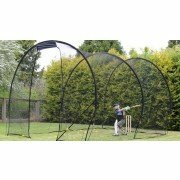 Preventing balls from leaving the surrounding area, the batting nets is perfect for use in the back garden. An affordable option, the GS5 Home Ground Cricket Batting Net gives batsmen the confidence of playing their shots with full force, without the fear of losing any balls, allowing practice sessions to be on your doorstep, literally.